If anything gave away the nature of our last league campaign on this site, it was the overuse of one particular phrase. Not “disappointing performance”, “shambolic defending” or anything like that. The key phrase was “last season’s cup run” possibly followed by “that magical afternoon at Anfield.” Spending most of one's time looking back betrays the fact that one feels they might have nothing else to look forward to. However, that entire caper seems a lifetime ago now. Well, not a lifetime perhaps but certainly a footballing generation as, but 18 months later, only one player remains from the sixteen who pulled on that one off ‘Probably’ shirt, or even just sat in the stand in a tracksuit, that magica…, ahem. Either way, it’ll be increasingly difficult to cling to its straws. Still at least ‘that thing which I shall try not to mention’ provides better memories for Shaun Gale than his last trip to Selsey. It was here six years ago, in this quaint ground tucked away at the back of a Budgens supermarket car park, that his playing career ended. No-one who was there, least of all Shaun, will forget the loud snap of his arm breaking in three places. It failed to heal sufficiently and he’s been working from the bench as assistant manager or head honcho ever since. To a certain extent, the start of this pre-season should represent a chance for Galey to assert his managerial worth; an opportunity for him and those players who remain from last season’s uninspiring lumber to give the slate a good old scour with the Cillit Bang. It’s a new world order in the assistant manager role too, with coach Steve Johnson promoted following the departure of the less-than-PR-friendly Charlie Oatway. One would hope that Steve will be somewhat less inclined than his predecessor towards telling fans to f*** off. I say about the players remaining treating this as a new Year Dot but, as it goes, hardly anyone does remain. Going into this first pre-season jog-out, our first team squad had been more depleted than we had imagined it would be. The talk was of tinkering, now it’s the kind of wholesale change you usually only expect from a team promoted the previous summer who had given a chance for their title winners to prove themselves at a higher level, but with almost disastrous results. 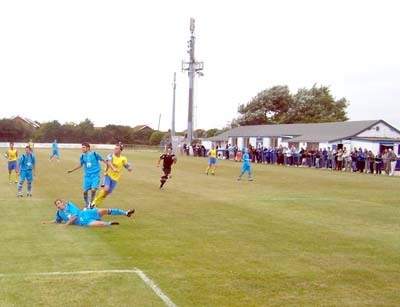 Supporters' player of the year Gary Elphick left to pursue football at the level above with Eastbourne Borough whilst the runner-up Craig Watkins’ contract negotiations also reach an impasse as he apparently required extra bunse to ‘match’ the elevation his reputation undertook last year. One would like to think that Craig appreciated that it was Shaun Gale’s faith, when virtually no Hawk supporter could see the value in keeping Craig last summer, that helped push him on, and factored that in as he chased the extra fold, particularly when there’s precious little of it about in lower league football. Indeed, we have reduced our playing budget and self-imposed a salary cap as we expect sponsorship monies this year will be rarer than free-jazz in the Top Ten. More’s the pity, on both counts. Elsewhere Charlie Henry took time out from his summer job populating crowd scenes in Railway Modeller magazine to take his injury-prone body to Newport County. 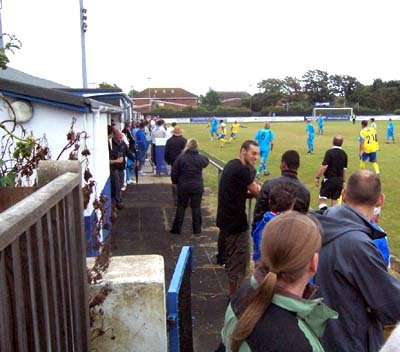 South London has been a popular destination with Matt Gray, as brittle as Charlie Henry but with a head that looks like a man’s thumb, ending up at Carshalton Athletic; keeper Kevin Scriven replacing another ex-Hawk, Paul Nicholls, between the sticks at Sutton; whilst club captain Jamie Collins has signed on the dotted line at Hampton & Richmond Borough. 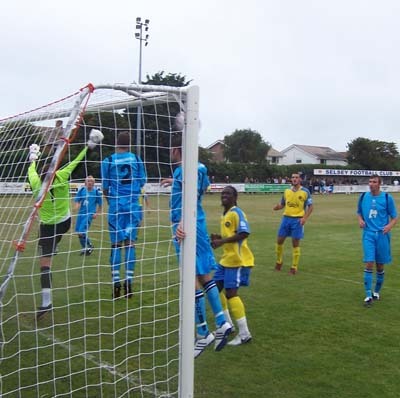 Jamie will be missed as he certainly took the responsibility of captaincy seriously, and I shall never forget him striding from his position as emergency goalkeeper, following Scrivs’ sudden departure from the field, to take a penalty against Bognor last Christmas. Courageous and theatrical, the best combination in this entertainment business we so love. JC is not the only long-serving Hawk to depart either, with Brett Poate realising his bizarre ambition to be mentally destroyed by Ian Baird again, this time at Eastleigh. Anyway all this activity meant that our cupboard looked so bare, it appeared to have been bought up and aggressively asset-stripped by a company registering their name as ‘Small Doors, Hinges & Tiny Screws Inc.’ However the draft caused by the revolving door spinning so quickly has swept in a few names to plug a gap or two, mostly up top. The new striking partnership of Manny Williams and Mustafa Tiryaki has even caused fans of opposition clubs to lose a little dribble, but we won’t be fooled again by outsiders telling us how great we’ve got it. That got us all excited last year, and look what happened then. Meanwhile the other new acquisitions are just a poorly attended reunion party away from having been brought together for a programme called Justin Lee Collins Brings Back...Havant & Waterlooville. 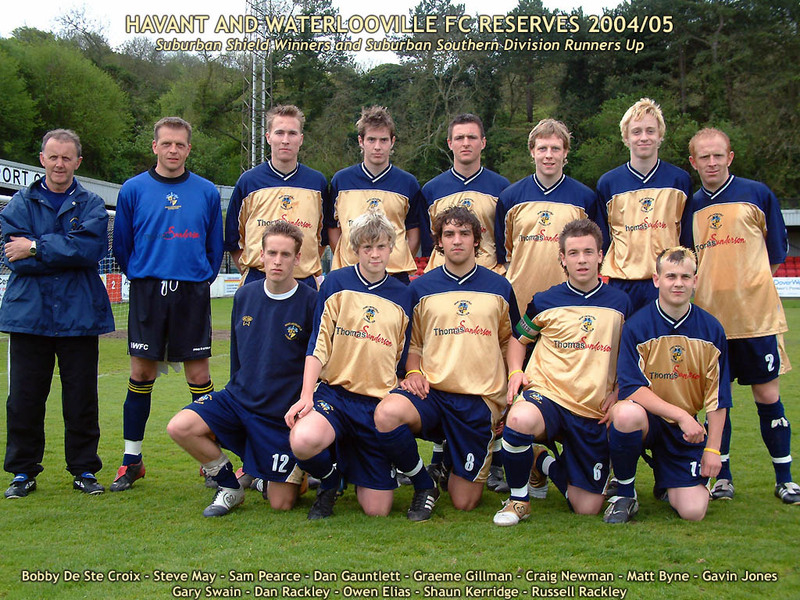 Firstly, we’ve re-signed Sam Pearce (seen at the back of this old reserve team photo), who was playing for Salisbury City in the Conference National at the end of last season, but started his football life in our youth team in 2002. Despite their success, Dave Leworthy and Bobby De St Croix’s unit of young ‘un’s (disbanded in 2005, the current Academy being a seperate entity) only seemed to be able to produce decent quality Wessex League players, but Sam has developed at his own pace and it’s good to see him back with us. Gary MacDonald’s re-signing is a proper nostalgia hit, having played for us prior to decimalisation. Well, to be a little more accurate, he played in defence alongside Liam Daish between 1999 and 2001 before being snapped up by Barry Fry for Peterborough United. Good old Barry. I used to have a boss who would seemingly spend all their time away from work glued to QVC and every day a new box with those big three letters on the side would arrive for them. Barry Fry used to have a similar approach to signing young non-league players. I think he used to send a van with some heavies around the country to bag ‘em up after training and transport them to London Road. This is what is meant, I believe, by ‘undisclosed fee’. 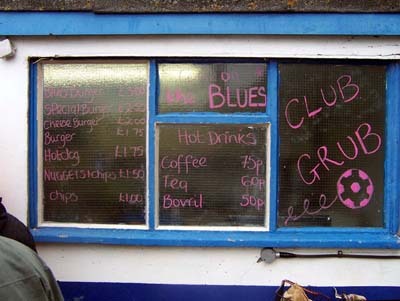 So, despite a few new bodies, the mass exodus meant that we turned up at Selsey expecting to find the away dressing room less populated than a windowless bar promising, on a ragged and stained piece of A4, “Tonight! Tramps with matted beards strip for YOU!” As it turned out though, we had enough bodies in tow to play an entirely different XI in both halves. In the first half, what might generally be termed the first team turned out, with Manny Williams bundling in a goal after only five minutes, whilst in the second half it was virtually all unknown faces. The exceptions to this were Paul Hinshelwood and Guy Butters, the latter jogging about to make rumours of his retirement seem more than a little premature. It appears he’s not ready just yet for a knee blanket and corduroy cap. Aside from them, it was a big day out for the Trialist family. Alan and Brian are often seen scoring goals in the lower Scottish divisions, but today we were also able to field their brothers Chris, Dave, Edgar, Frank, Graham, Harold and Ian. Probed for their real identities, our club secretary, in his traditional July slight of hand, was acting so cagey if he’d have opened up his blazer you’d have half expected a parrot to fly out. Eventually, we got a glimpse of the sacred text (well, a notepad that may well have been part of a 99p double pack in Wilkinsons) but as we don’t wish to alert other clubs to the availability of some of these fellas, it requires a clandestine closing of ranks, and so I cannot possibly reveal those who turned out. Generally it’s all about ‘lobby terms’ at this time of year, about being in the loop and not a blabbermouth, and nothing whatsoever to do with the fact I can’t remember any of their names anyway. One of them scored a penalty though, I can tell you that, and another beefy striker looked a lot like Busta Rhymes*. That aside it was your typical early July stroller to remind us all what a football looks like. Mind you, the balminess that usually makes these early bucket-and-spade days out to the Sussex County League in any way attractive was in absentia; a heavy cloud hung over the place throughout with a belligerent drizzle falling upon us at the end of the first period. Mind you, as the cricketers in the adjacent field were happy to crack on with their game regardless, it would seem a bit churlish to moan too much. After all, we supporters need to ramp up too, and get our sea legs for the long winter months. Well, hopefully they won’t feel too long this year. *As it turns out a number of names have leaked onto our semi-official website, so be blown away by the information that the penalty scorer was, in fact, Gary Norgate whilst the Busta-a-gram was former Sutton chunk of meat Craig Dundas.